What are the key challenges facing Peru? Peru is famous for its Inca ruins, Amazonian jungle, and diverse and colourful culture. 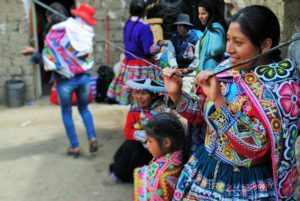 Despite its recent history of civil conflict and violence at the hands of the Shining Path terrorist movement which led to the loss of over 70,000 lives between 1980 and 2000, Peru is today one of the fastest growing economies in Latin America. With significant advances in poverty reduction over the past decade, the future for Peru seems bright. However, as with many emerging economies, this growth has too often led to deepening inequalities rather than promoting widespread and equitable development. The top 20% of the population controls over half of the national wealth while almost a quarter of Peruvians continue live below the national poverty line of $2USD per day. Access to safe, fair and meaningful employment remains a key challenge for many Peruvians with 46% of the adult workforce employed in ‘vulnerable’ employment; that is forms of work characterized by low wages, low productivity and unsafe or unsanitary conditions which do not uphold workers’ fundamental rights. With many people working outside the formal economy, access to banking and credit is limited with only 20% of Peruvians having access to a personal bank account. Peru’s growth has therefore left many people behind. What is Mary MacKillop Today doing to respond to the need in Peru?